Alliance of Polar: Cambria Ella Dark Cabinets Backsplash Ideas is another opposite conjunction in your kitchen remodeling. Different variation of the dark cabinets is being more attractive by using Cambria Ella. Backsplash completes this subtle touch entirely. As a rule of kitchen remodeling, white countertops always give a good contrast with dark cabinets. Cambria Ella Dark Cabinets Backsplash Ideas helps to speak your mind with a delightful expression when the backsplash type and material can be selected. In this article, the color and stain of the dark cabinets will be named. 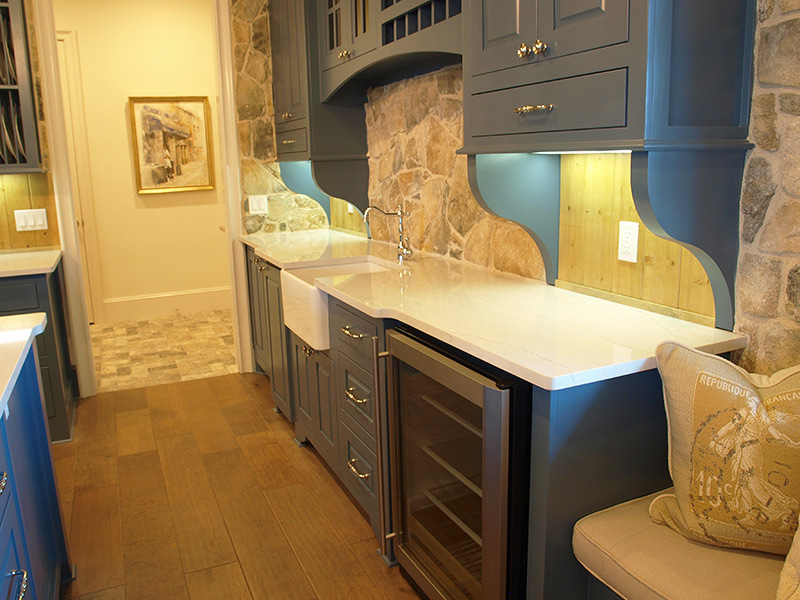 Usually navy blue or sapphire blue dark cabinets are used by the creative minded designers. Still classic chocolate brown cherry cabinets are very attractive for marble look Cambria Ella Countertop if the gray backsplash is chosen. The best matching backsplash colors for Cambria Ella Dark Cabinets Backsplash Ideas are creams, soft beiges, earth tone browns, grays and whites. Modernized Muse: Marble Look Cambria Ella Countertop can also be reviewed if you would like to use some full high backsplash. For my opinion Cambria Ella is no maintenance countertop and no maintenance backsplash as well. The material for the backsplash can be ceramic, glass, marble looking Cambria Ella herself and natural slate. The type of the backsplash tile would be usually subway, novelty and natural looking stones. As I mentioned in my previous article Cambria Ella Countertop White Cabinets Backsplash Ideas, picture selection of Cambria Ella was very limited. Hope you will have an opinon about Cambria Ella Countertop Dark Cabinets Backsplash Ideas by checking out below pictures. Picture Credit: Cambria Usa via Houzz., Sapphire Blue Dark Cabinets , Cambria Ella Countertop and White Ceramic Subway Tiles. Very fine taste of combining the attraction of opposites. Star design ceramic flooring kitchen tiles add some extra delightfulness to the kitchen design. Picture Credit: Hatfield Builders and Remodelers. and Photography by Versatile Imaging, Another eye catching job from Hatfiled. Cabinets has a rich cherry finish Java G-3 and topped them with Cambria Ella counter tops. The novelty iridescent mosaic tile back splash finishes off the transitional look, which is called Bombay Glass Mosaic. I think, marble looking backsplash matches well with marble looking countertop. The puzzle is completed very well by using brushed silver stainless steel appliance. Picture Credit: ADC Kitchen, Unfortunately this store is closed. The navy blue soft cabinets with Cambria Ella Countertop and Natural Slate Backsplash mix with rustic style wooden backsplash give very smooth looking. I think floor is oak planks. Anyhow a very good example for the no maintenance, marble look Ella Countertop while the backsplash selection is done perfectly right. Sharing your opinions and pictures will be appreciated for my curious followers. Let built a nice article together for Cambria Ella Countertop Dark Cabinets Backsplash Ideas.